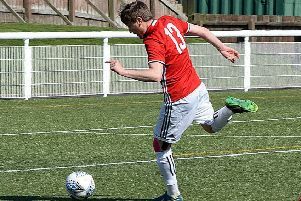 Hawick Royal Albert gave themselves a somewhat unexpected pre­Christmas present at Ainslie Park on Saturday by delivering the goods to the full to topple high-ranking Spartans. With a strong wind at their backs, underdogs Hawick produced some early bark and came close to scoring in the opening minutes when Blake Wales fired wide. An organised looking Spartans side began to fit into the groove after this however, and after Blair Atkinson had shot inches past the post, Chris Anderson had a header well saved by Albert keeper Kyle Rankin. The Edinburgh men continued to look the part and the better of the remainder of the first half. Due to some resolute Hawick defending and the squandering of one or two chances, Spartans, however, failed to come up with a goal. The second period began in a similar fashion. In the 59th minute, the deadlock was eventually broken, but it was Hawick who did the scoring. Alieu Faye threaded a pass to the feet of Josh Morris and the former Berwick Rangers player surged forward to rattle a shot past home keeper Daniel Cassells. Minutes later the Albert almost got a second when Ryan Stevenson worked his way into the clear before unleashing a shot which Cassells did well to block. With 68 minutes gone Spartans equalised when a flowing, passing move ended in Jamie Dishington shooting home. Hawick came rallying back and Faye had a net bound header cleared by Alistair McKinnon following a Wales corner kick. With seven minutes remaining the Albert snatched what was to be the winning goal. After latching on to a superbly flighted Daryl Johnson cross field ball, Morris thundered a shot into the net. Speaking of his side’s excellent triumph, Hawick defender Craig Robertson said: “It was a great result for us to beat Spartans.